ਲੱਚਰ ਗਾਇਕੀ ਖ਼ਿਲਾਫ਼ ਪੰਜਾਬ ਪੁਲਿਸ ਦਾ ਪਹਿਲਾ ਵਾਰ,ਇਸ ਗਾਇਕ ‘ਤੇ ਹੋਈ FIR ਦਰਜ ..
ਉਨ੍ਹਾਂ ਦੱਸਿਆ ਕਿ ਫਿਲਹਾਲ ਗਾਇਕ ਰੌਕੀ ਭੱਟੀ ਿਖ਼ਲਾਫ਼ ਮਾਮਲਾ ਥਾਣਾ ਸਿਟੀ ਵਿਖੇ ਦਰਜ ਕਰ ਲਿਆ ਗਿਆ ਹੈIn what is being seen as action against glorification of violence in Punjabi songs,budding singer Rocky Bhatti was on Wednesday booked on charges of defacing public property and a poster of his new song showing him and two others, one of them holding a gun — was taken down from near Government Ranbir College. 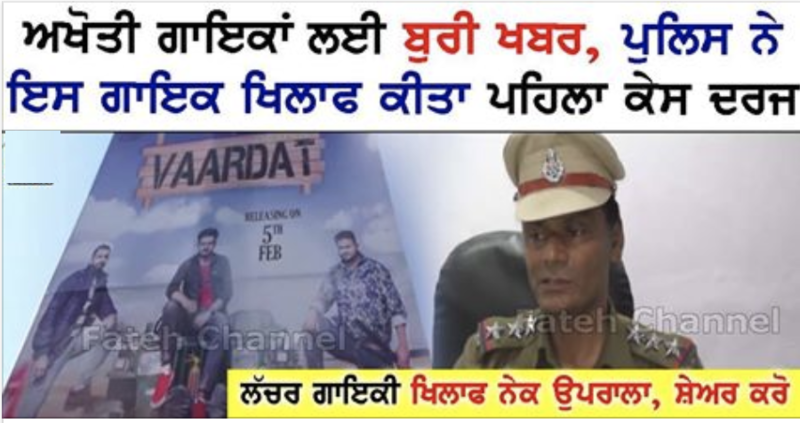 said senior superintendent of police Mandeep Singh Sidhu over the poster with “violent content”. Inspector Vinod Kumar, station house officer, said, “We will also probe the producers, and more persons can be booked, including those seen in the poster.” The poster features photos of seven other men.This comes days after the state’s directorgeneral of police directed all SSPs to meet singers in their areas and appeal against lyrics promoting liquor and violence. Previous PostPrevious ਤਾਜਾ ਵੱਡੀ ਖਬਰ – ਆਹ ਦੇਖੋ ਕਲਜੁਗੀ ਧੀ ਨਾਲ ਕੀ ਹੋਇਆ …. Next PostNext ਪੁਨੀਤ ਨੂੰ ਬਠਿੰਡਾ ਤੋਂ ਪੰਜੌਰ ਖਿੱਚ ਲਿਆਈ ਮੌਤ ….